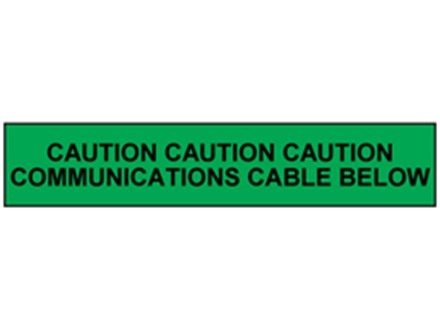 Home > Tapes & Floor Markers > Construction Site Tape > Detectable Warning Tape > Caution communications cable below tape. Caution communications cable below tape. Caution fibre optic cable below tape. Caution heating main below tape. Caution rising main below tape. Caution road lighting cable below tape. Caution surface water drain below tape. Caution communications cable below tape. Detectable underground warning tape. 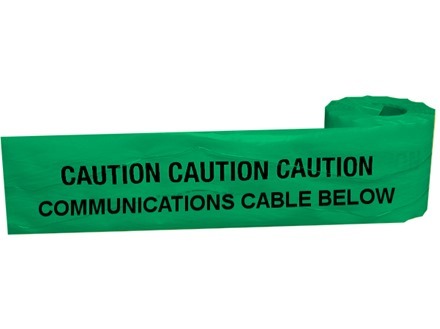 Communication below tape is used for marking and informing people of buried co-axiel or fiber optic cables to data services or telephones. If the tape is not displayed it could effect the phone connection in the surrounding areas. Detectable underground warning tape. Caution communications cable below. Waveywire, with stainless steel tracers, to identify the presence of buried cables, pipes, pipework, sewers and ductwork. Rot resistant. UDT011 Size 150mm x 100m. Material polythene. (Virgin low density grade, 50 micron thickness containing no PVC).